In 1999 the American Academy of Periodontology (AAP) convened an international workshop to revise the classification of periodontal diseases and conditions (PDS). The previous classification had a verity of problems and missing criteria. • Genetics Evaluation of telomerase expression in chronic periodontitis. 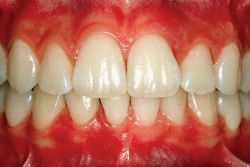 Periodontitis is very common, and is widely regarded as the second most common disease worldwide, after dental decay, and in the United States has a prevalence of 30–50% of the population, but only about 10% have severe forms. Like other conditions that are intimately related to access to hygiene and basic medical monitoring and care, periodontitis tends to be more common in economically disadvantaged populations or regions. Its occurrence decreases with higher standard of living. In Israeli population Ethnic origin and alveolar bone loss in Israeli adults, individuals of Yemenite, North-African, South Asian, or Mediterranean origin have higher prevalence of periodontal disease than individuals from European descent. Presumably, individuals living in East Asia (e.g. Japan, South Korea and Taiwan) have the lowest incident of periodontal disease in the world. There are many surgical approaches used in treatment of advanced periodontitis, including soft tissue and osseous surgery, as well as guided tissue regeneration and bone grafting. The goal of periodontal surgery is access for definitive calculus removal and surgical management of bony irregularities which have resulted from the disease process to reduce pockets as much as possible.